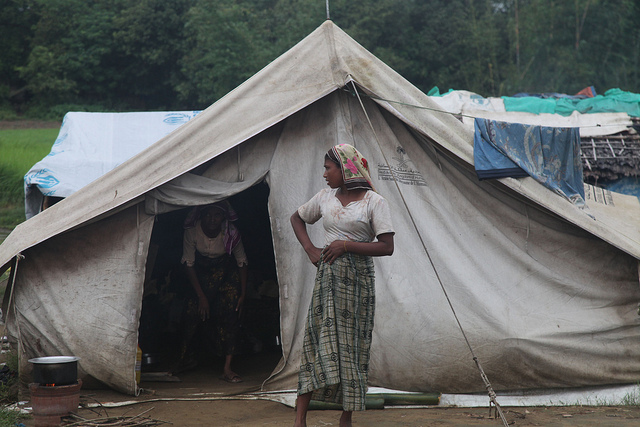 There are more than 800,000 Rohingyas residing in Burma, mostly in the province of Rakhine. The Rohingya are considered by the United Nations to be one of the most persecuted minorities in the world. Photo courtesy of IFRC. The Rohingyas have been subjugated to mistreatment for years, but a recent wave of targeted ethnic violence towards the community has led to a humanitarian crisis in Rakhine. Since the unrest began in June, thousands of Rohingyas have been forcibly relocated to refugee camps, hundreds have been killed and dozens more are missing. • In June, dozens of people are killed in ethnic clashes sparked by reports of a Buddhist Rakhine woman allegedly being raped and murdered by three Rohingya men. In response to the violence, a state of emergency is declared with the introduction of martial law. • President Thein Sein meets the UN High Commission for Refugees António Guterres and suggests that the only solution is to send the Rohingyas to UN-administered camps or to a third country. • In October, widespread violence erupts again in Rakhine as well as other areas in the state, which have been relevantly peaceful. Curfews remain in force. • The United Nations warns that Burma’s fledgling democracy could be irreparably damaged. • New satellite imagery obtained by Human Rights Watch shows hundreds of buildings and boathouses burned to the ground, presumable by arson. • About 120 people are missing after a boat capsizes in the Bay of Bengal. Most of the missing are Rohingyas fleeing the violence. • Aid agenices including Doctors Without Borders (MSF) say they have been prevented from providing essential medical services to those in need. • A report by the International Crisis Group (ICG) confirms that Kaman Muslims are also being targeted. The attacks appear well coordinated and directed towards Muslims in general. • UK Foreign Secretary William Hague urges Burma’s leaders to resolve the citizenship status of the Rohingya. The government has classified the Rohingyas as “illegal” immigrants. • The White House announces that U.S. President Barack Obama will be visiting Burma, the first-ever visit by a U.S. president to the country. He will meet with President Thein Sein and opposition leader Aung San Suu Kyi. Human rights groups say he should not go there until political and economic reforms have been consolidated. • A Reuters investigation reveals that waves of attacks against the Rohingyas and other Muslims in the area were organized by the central-government military, abetted at times by local security forces.